You’ll remember me blogging about OPI It’s My Year not long ago. 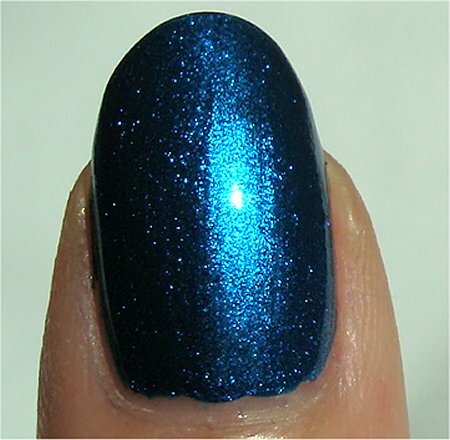 That was the polish on my list when I went into Trade Secrets. 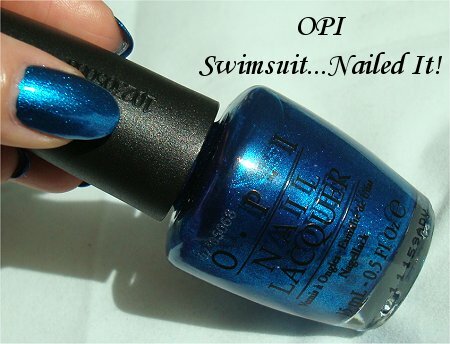 But as I picked it up, another colour caught my eye on the display – OPI Swimsuit…Nailed It! It didn’t dawn on me until recently that because I’m so obsessed with green polish, I don’t swatch or review enough blues (even though I really love them, too). 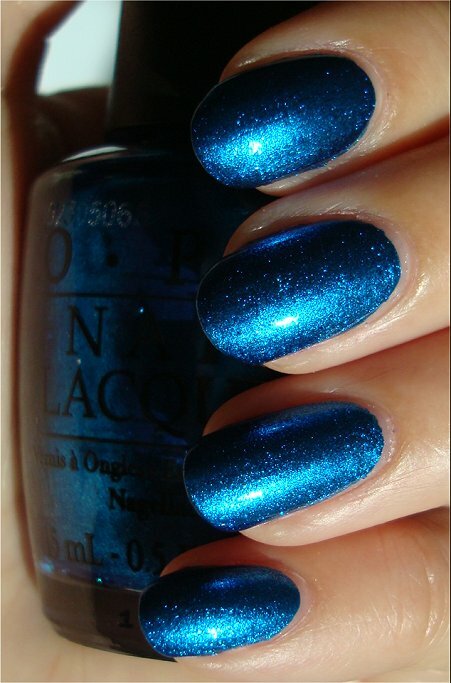 2 coats of OPI Swimsuit…Nailed It! Swimsuit…Nailed It! is a vivid blue that’s the life of the party. 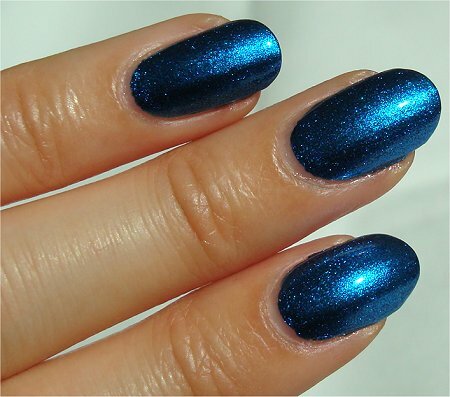 In the sunlight, it’s magical – you can see the shimmer dancing on your nails with very little hand movement. In dim light, you get a cool ‘pixelated’ effect that’s much duller than in sunlight (of course). And with flash, this sucker goes nuts! 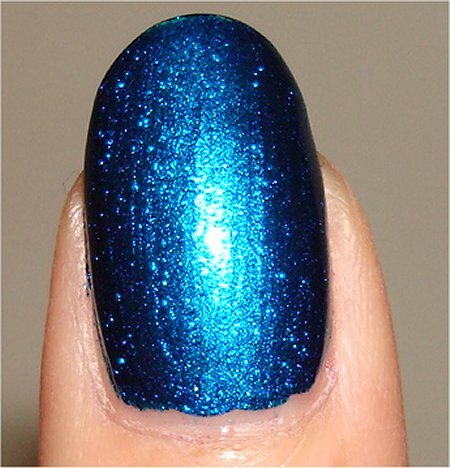 This jewel-tone blue is a shade that I can see being very flattering on people of all different skin tones. The pictures don’t lie. It’s a super-sparkly shimmery foil. Since it’s not glitter, the finish is smooth instead of gritty. Also, I didn’t use a top coat, and look how shiny it dries by itself! Okay, it sounded perfect up until now. I had a little surprise when I removed this. Be prepared for Smurfy nails and cuticles! But don’t worry, the staining isn’t permanent (as long as you used a good base coat!). Even though your nails and skin will be blue afterwards, you just have to wash your hands thoroughly several times and the blue dye washes off and makes you resemble a member of the human race again. If you’re in a rush somewhere and want to remove this polish and paint your nails another colour, my recommendation is don’t! You’re going to need time to remove this one. If you’re a fan of blues, this is a pretty one to own. Although it’s not the most unique blue ever, I still consider this a winner! 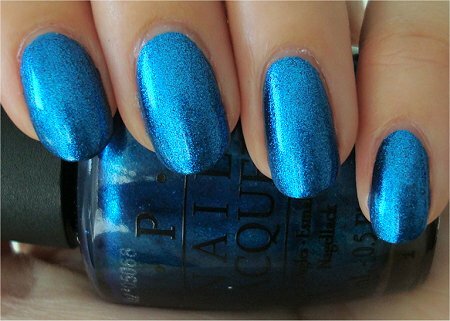 Would you like to see me swatch and review more blue polishes? 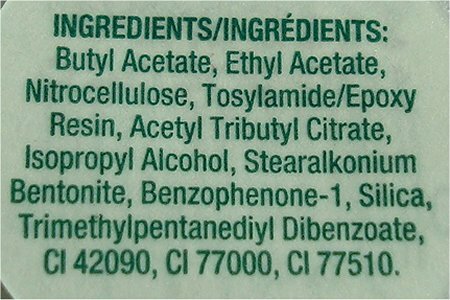 What’s the worst-staining polish you’ve ever worn? 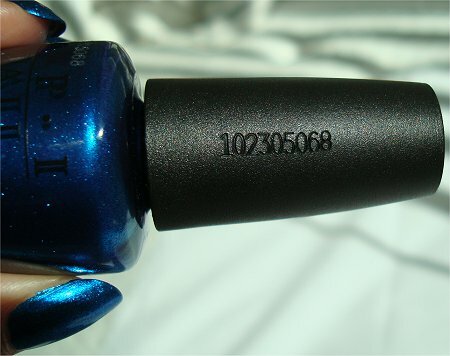 Have you noticed the new serial number engraved on OPI handles? 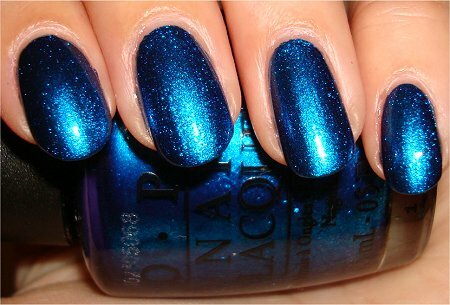 This entry was posted in Nail Polish Swatches & Reviews, Product Reviews and tagged OPI on September 3, 2011 by Mary S.. It sparkles so brilliantly. I didn’t want to take it off! This one snuck up on me. Wasn’t expecting to get it, but it came home with me (laughing evilly to itself at its own brilliant scheme on the ride home, I might add). I just really wish that it was easily to remove. But at least the dye does come off after several hand-washings. Ahahah! I’m happy to hear that you liked my swatches that much! 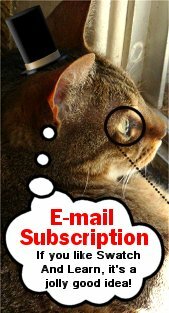 Hehe, but I took a look at Orly’s Sweet Peacock online. It looks really pretty, too! And if it doesn’t stain at all, more power to it! Haha, I like that line: “Altho turning into a smurf was never on my to do list”. That’s pure gold right there. Love this color! The foil finish totally makes it for me. 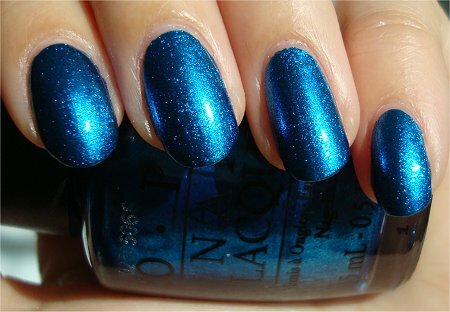 I’m a fan of blues so I certainly wouldn’t mind more blue polish reviews. That’s interesting about the serial number. I haven’t seen that on an OPI polish myself. I actually don’t think I’ve worn a polish that stained me yet. I hope that stays that way! 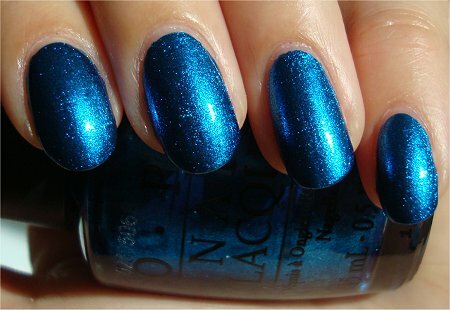 Maybe OPI is cracking down on counterfeits more now. Serial number on the handle, bottle, and label. Seems a bit excessive, though. Wow! What a pretty shade of blue! 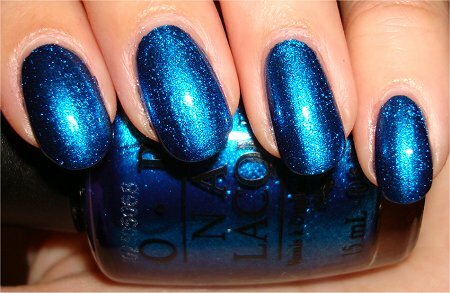 I’ve been poking around online lately looking for nail polishes to update and expand my collection and I was looking at this one just yesterday. 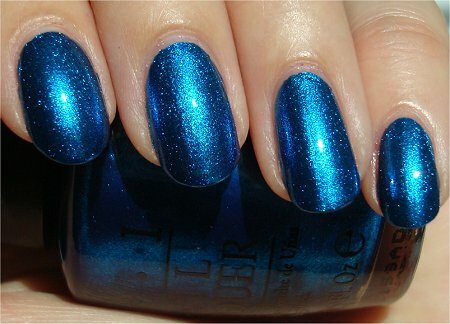 I’ve never worn a blue polish before but, like you said, it looks like this one is universally flattering. Thanks for swatching it! 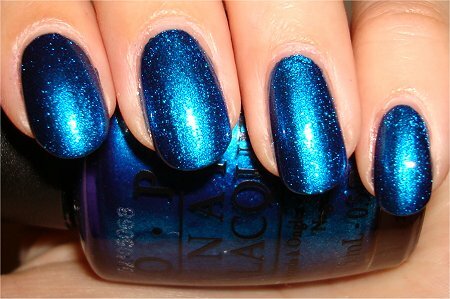 This is definitely a stunner on anyone’s nails. 🙂 Just makes sure you’re prepared to spend a lot longer removing this polish to get it off your skin and nails. And don’t forget to wear a really good base coat…or even two layers of it for added protection! You’re most welcome. 🙂 I love sharing swatches! I love this color! I bought it a few weeks ago when I saw it at a beauty supply store. I went there for the purpose of getting it and I got really bummed when I didn’t see it right away, but turns out the display was above another display the whole time. So I was happy. 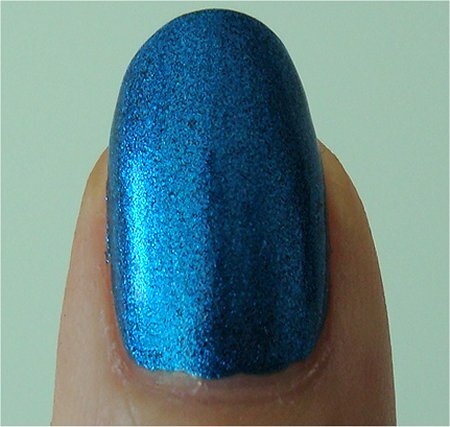 I haven’t worn it yet, but I did swatch it on my nail wheel and it’s such a gorgeous blue. I was really amazed at how opaque it was. I have nothing like it. The other colors are pretty too but they seem kind of dupe-y to me, especially the Congeniality color. Crown Me Already! is probably the only other color I’ll get, or maybe It’s My Year even though it’s dupe-y too but I don’t own any of the colors similar to it. Very pretty! I’m adding this to my wish list. How long does it take you to take photos for your post? Do you take a million photos and then it takes you forever to go through them to pick the perfect ones? I’m seriously in love with your blog. I love how all your reviews are in the same format and you cover everything that needs to be covered. 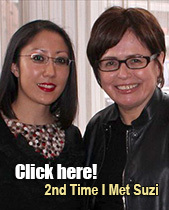 I know you must spend a lot of time on your blog. It is worth it because your blog is great! Thank you for appreciating my hard work! 🙂 It’s always nice to hear that. Taking the photographs is usually pretty fast. I go trigger-happy with nail-polish photos. Since, for those reviews, I want to show the colour in different lighting, I usually wind up taking about 200 or so photos of a single colour. Then I look at them on my computer and crop and resize the ones I think look the sharpest. (My hands aren’t the steadiest, so even though I take 200 photos, there are probably over 30 that are super blurry because my hand shook…haha!) Definitely the ‘picking process’ and the editing take the longest time for me. Writing each post is a snap…probably because I find that part to be the most fun. Josefin recently posted: I’m still alive! It sparkles like crazy – that’s why it caught my attention unexpectedly in the store. OH MY GGAAAAAAAAWWWWWDDD!!!!!!!!!!!!!!! This color just made my heart flip and do a little dance routine!! This is SOOO gorgeous!! Like blow-my-mind-making-me-go-crazy-mouth-open-in-disbelief-of-how-pretty-this-color-is GORGEOUS!!! If I don’t get this soon, I WILL DIE!! Hahaha, no, no, no! You will still survive even if you don’t get it. But I still hope you can get your hands on it. In person, it looks incredible!